← 1981 — Weehawken waterfront an albatross! James F. Murray, Jr. (1919 – 1965) was Democratic New Jersey State Senator for Hudson County from 1954 -1958. He also served as a leading member of Jersey City’s municipal government, first as President of the City’s Board of Tax Commissioners and later as City Commissioner and Director of Revenue & Finance. Born in Jersey City, New Jersey, he was the only son of James F. Murray, Sr., a long-time political opponent of New Jersey political Boss, Mayor Frank Hague. 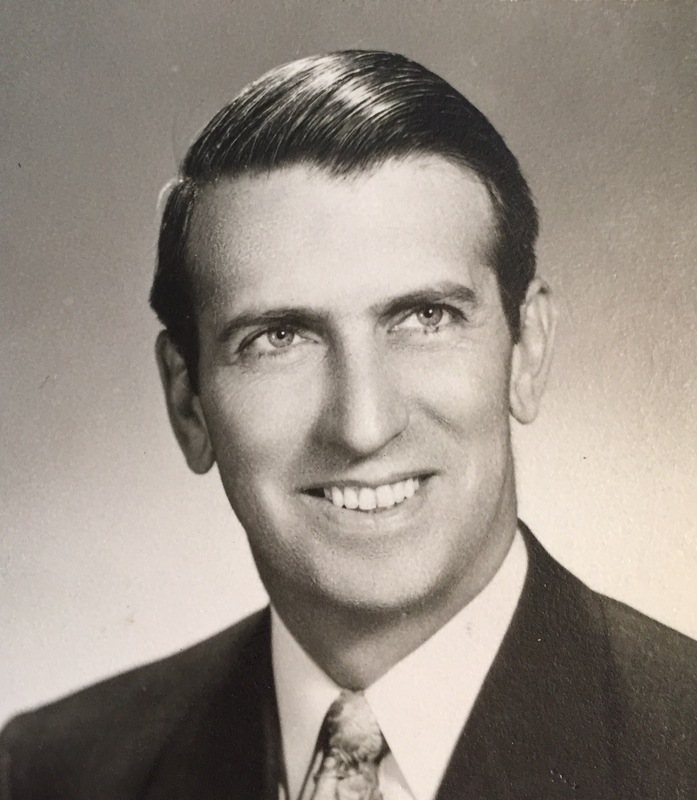 Three generations of the Murray family had been active in Jersey City politics. Murray’s grandfather was Tax Assessment Commission under Republican Mayor Mark Fagan; whereas his granduncle, George J. Murray, close friend and early supporter of Mayor Frank Hague, was City Poormaster for twelve years. J. Owen Grundy, History of Jersey City (Jersey City, N.J., 1976). Finally, in 1949 Murray, Sr. joined forces with defecting Hague lieutenant and downtown ward leader, John V. Kenny. Together they challenged Hague’s machine by forming the Freedom Ticket. The Freedom Ticket defeated Hague’s slate of candidates in a tumultuous municipal election, thus ending Hague’s 37 year reign over Jersey City. Kenny became Mayor. Murray, Sr., who won with Kenny, became one of the newly elected City Commissioners. But the Murray pact with Kenny was short-lived. 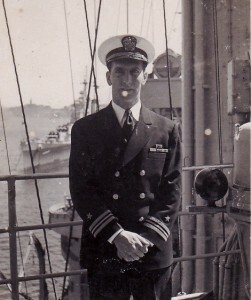 In 1950 Commissioner Murray defied the new boss by running his son (James F. Murray, Jr.), an attorney and decorated World War II veteran, for Congress. Commissioner Murray was soon punished for his independence. Kenny illegally stripped him of his official powers, alienated him in City Hall and sought to humiliate him in the eyes of the public. But Kenny’s power play backfired. The Murray-Kenny feud lasted for two years, costing Kenny dearly in public opinion. Wanting to end his prolonged public battle with Murray before the 1952 municipal election, Kenny negotiated a truce. Murray would be nominated to become Hudson County register, while his son was offered a run for the state senate. But before the deal could be consummated, Murray Sr. died in 1952. His sudden death while still in office aroused massive public sympathy. In a shrewd manoeuvre, Kenny made a public act of contrition by deciding the city’s newest public school would be named in honor of his political nemesis, James F. Murray, Sr. He also embraced Murray Jr., who then became his father’s standard-bearer. 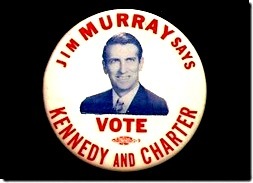 The young Murray ran for the senate seat in 1953 and won impressively. 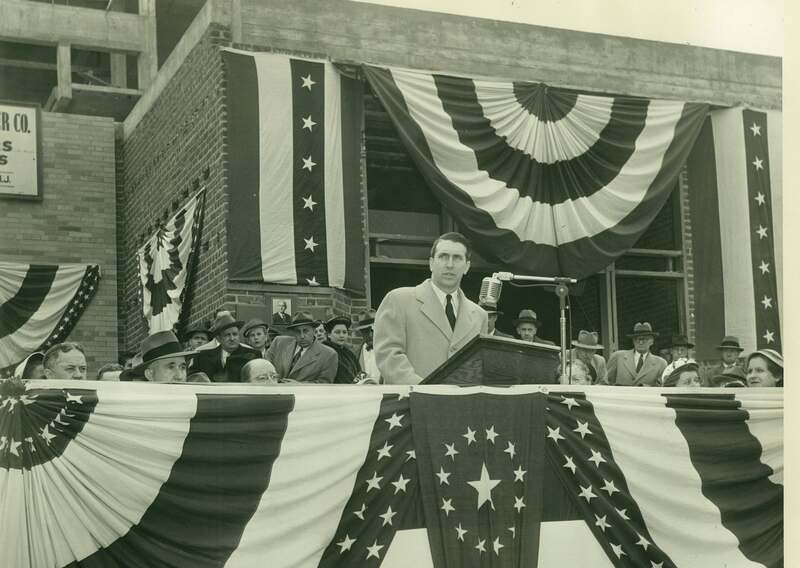 State Senate candidate James F. Murray, Jr. speaking at corner stone laying ceremony for James F. Murray School (PS 38) in 1953. But it was not long before Murray Jr. turned on Kenny. 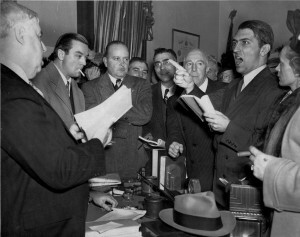 He used his position as senator to antagonize the Boss, challenging him openly and thwarting his patronage from Democratic Governor Robert B. Meyner. 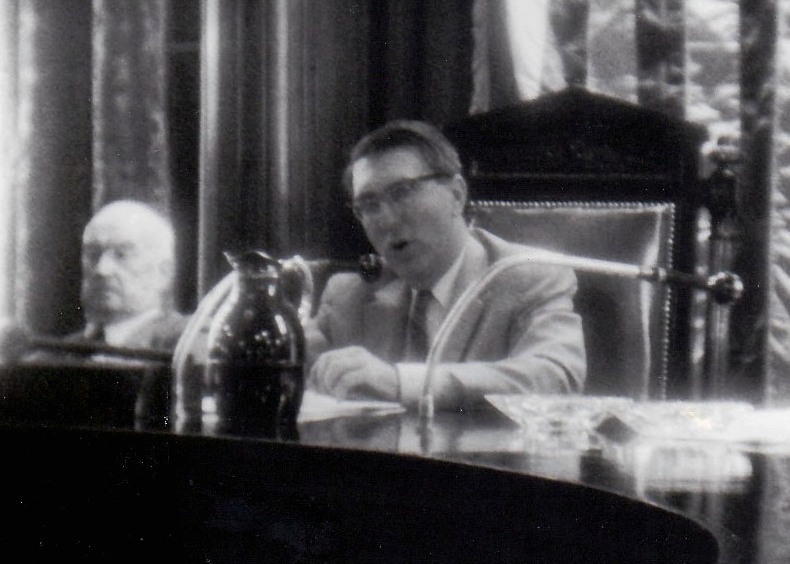 Following a distinguished but short tenure as state Senator, James F. Murray, Jr. became the leading figure in City Hall during the term of what would be the city’s last commission government. Victory Ticket at City Hall on election night, May 14, 1957. Left to right: Charles S. Witkowski, Thomas Gangemi, State Senator James F. Murray, Jr., William V. Mc McLaughlin, and August W. Heckman. In 1957, Senator Murray led the “Victory” reform movement which produced a major upset in the Jersey City municipal election. This Victory Ticket win broke the 8-year hold over City Hall by Hudson County Boss, John V. Kenny. In addition to Murray, the 5-man ticket comprised Thomas Gangemi, William McLaughlin, Charles S. Witkowski and August W. Heckman. Four Victory candidates were elected to the City Commission, sweeping aside all but one of Kenny’s City Hall incumbents. Ironically, Thomas Gangemi, who originally organized and funded the opposition slate, failed to win. By polling 63,449 votes, Murray, ran first in a field of ten candidates. Widely expected to become mayor, Murray, having captured the most votes, assumed the office was his. But Thomas Gangemi, deeply humiliated by his defeat, used his influence over the other Victory Commissioners to ensure that Charles Witkowski was chosen as mayor instead. “Bosses & Reformers: Jersey City Victory Movement of 1957” published in New Jersey History, Volume 103, Numbers 3-4 (Fall/Winter 1985). From 1957-1961 Murray was mayor of Jersey City in all but name. As Director of Revenue & Finance, he energetically pursued an array of visionary programs, promoting urban renewal and economic redevelopment. 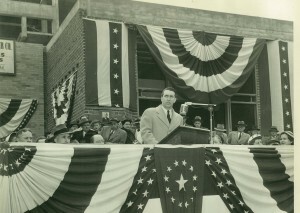 In 1960 Murray championed reform of the city’s system of government. Along with fellow commissioner Bernard J. Berry, whom he backed for mayor in 1961, Murray spearheaded the Charter reform movement to scrap the commission form of government in favor of a mayor and city council. The Charter referendum passed, but Berry lost the 1961 mayoral election to Thomas Gangemi, who after losing in 1957 had attached himself to Hudson County Boss John V. Kenny. Unable to sustain the Victory movement as a viable alternative to the Kenny machine, Murray left active politics at the end of his term of office. His final years were spent with the law firm of Murray, Nobeletti & Kenny in New York City. He died in early 1965 at the age of 45. Like his father, Murray Jr. was the product of a Catholic Jesuit education. After graduating from St Peter’s College in Jersey City, he attended Fordham Law School in New York receiving his law degree in 1942. In 1952 he earned an MA in European History from Fordham University. He practiced law as a member of the New York Bar specializing in international law. In addition to politics, Murray was active in journalism and broadcast media as commentator and presenter. He moderated the ABC Radio Series “America’s Town Meeting of the Air” from 1953 to 1955 and frequently hosted other radio and TV programs, such as “Author Meets The Critics” and “People’s Platform”. Known for his oratorical skills, Murray was a sought-after speaker in various public affairs forums. He was also an accomplished journalist and writer, whose published works include Eugenio Pacelli: Pope Of Peace co-authored with Oscar Halecki and “An Interview with Franco”. There is a large archive of Murray Family historical material housed at the New Jersey Historical Society under the “Murray Collection.” In addition, an extensive collection of photographs are in family’s possession. Included are original press photographs, many of the 1949 Freedom Ticket and 1957 Victory Ticket campaigns. Some such photographs were used in the article by Joseph M. Murray entitled “Bosses & Reformers: Jersey City Victory Movement of 1957” published in New Jersey History, Volume 103, Numbers 3-4 (Fall/Winter 1985). 3 Responses to JAMES F. MURRAY, JR.
Hello Cheryl Hickey. This is Joe Murray. Happy to correspond with you about this article.